With due credit to Irish Times rugby correspondent Gavin Cummiskey, the key motivation that will have driven two national coaches in particular during this week is the potential impact that Saturday’s results in the Six Nations will have on World Ranking points. We’ve Got My Priority, We’ve Got Your Priority. Let’s Start With Mine. "I'm sure you can see my point, Declan." 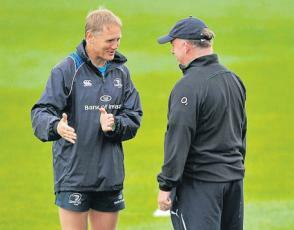 France and Ireland play away games against the only two possible winners of the Championship and their respective coaches will be doing all in their power to ensure that their players have the necessary motivation to summon up one last big effort, before they revert to the pursuit of European rugby glory in their respective clubs. The French Squad of 22 comprises 14 players from Toulouse and Clermont, who face Edinburgh and Saracens respectively at the same stage of the competition. Each of these five clubs have ample reason to believe that they can progress to ultimately become the European champions. The international players from these clubs, in particular, have dedicated their playing careers to winning – not merely participating. So with the prospect of success in the Six Nations already gone, PSA and Declan Kidney will have devoted considerable effort to emphasising the importance of world ranking points to preserve seeding positions for the next World Cup. Less emphasis will have been placed on the reality that summer tour fixtures will also play a major part in those rankings but coaches have to do what have to do to keep the pot boiling. After their much lauded performance in the World Cup Final, France were the European team to beat six weeks ago. Certainly, the whole of Wales looked forward to the prospect of the chance of revenge for their RWC semi-final defeat, but few outside the squad imagined that they would not only get this opportunity but that it could be crowned by the prize of a third Grand Slam in eight seasons. Having replaced the volatility of Marc Lièvremont with the experienced, multi-lingual, media friendly Phillippe Saint-Andre, the French public now see their ‘sane’ coach make six changes for the final game of the season, with only one of them dictated by injury. Evidently, “Le Goret” as PSA was affectionately nicknamed during his Clermont playing career, believes that the Welsh team can be fought in the scrum: his two changes in the pack signal the return of Servat and Attoub in the front-row. However, it is the return of Yashvilli at scrum-half that is expected to spark the French elan to life and put the Welsh under the sort of pressure that the Irish achieved for the ‘wrong’ 40 minutes in Dublin. Warren Gatland has a wonderful knack of getting the best from players under his coaching control. Whether with Connacht, Ireland, Wasps, Waikato or Wales, Gatland has constantly demonstrated the ability to disarm opponents by subtle tactical variations. Although PSA delayed announcing his line-up to the very latest moment demanded by the Six Nations organisers, it will be surprising if Gatland does not steal another march on Saturday in the manner by which Wales take on their opponents. The key to almost every Gatland strategic plan is using possession aggressively. He absolutely believes in game plans that set out to get ahead of opponents and feed off their attempts to play catch-up. He places huge focus on Matty Williams’ “championship minutes” and his teams often score early, just before and just after the halfway mark and crucially in the dying minutes of games. 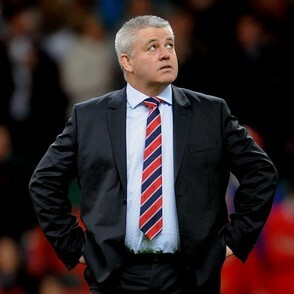 Gatland’s teams have also demonstrated the ability to perform on the biggest stage. He sets very specific objectives which take the focus away from ultimate results. He and Edwards are past masters at ensuring that their players play within their skills comfort zone, but at high pace in the early part of the game. Gatland and Saint-Andre have faced off before as coaches, albeit at club level. Wasps’ 43-22 victory over Sale in May 2005 to qualify for their third Premiership Final in a row will be one of the memories that Gats will fondly recall of those encounters. So what will the French try to do on Saturday? Certainly they will compete strongly in line-out and scrum. They’ll use their possession to run at the No10 channel and they’ll undoubtedly try to get their forwards to use the maul as an attacking weapon and to pick and go from tackles and rucks, to counter the Welsh “elastic” defence. Will it be enough? Nobody can be certain at this juncture, but the Mole is confident that the French will turn up to defend their reputation as a group and the future of their coaches [whom they like]. 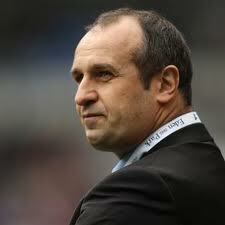 Gatland is the better coach, but France have players probably more familiar with winning. Finally, would you bet against Craig Joubert, bete noire of France five months ago, having a key part to play in the result? This entry was posted in Match Preview, Six Nations and tagged Cuddly Warren Gatland, Declan Kidney, France, PSA, Six Nations, Wales by dementedmole. Bookmark the permalink.